Download the great Murray Taylor App – FREE! East Scotland Accountants Murray Taylor are delighted to announce the launch of their mobile App. This App can be downloaded onto your iPhone, iPad or Android phone. It’s packed full of useful Tax Tables, Calculators and important dates. All of which you will be able to access anywhere you have an internet connection on your device. You can download the great new Murray Taylor App free of charge using the links or QR code below. To quickly and easily download it, simply search for ‘MyAccountants‘ in your app store – the icon looks like the image below. Then enter the code 3550 when prompted, and you’ll be able to access all of Paish Tooth’s new content and features! Please do let us know what you think by posting a review. What will the Murray Taylor App do for you? The App has been carefully designed in response to the growing use of Smartphones and mobile devices by our clients. We wanted to develop a way to keep you up to date with the very latest news, views and tips from Murray Taylor, as well as providing you with key accounting data, in real time, at your fingertips. 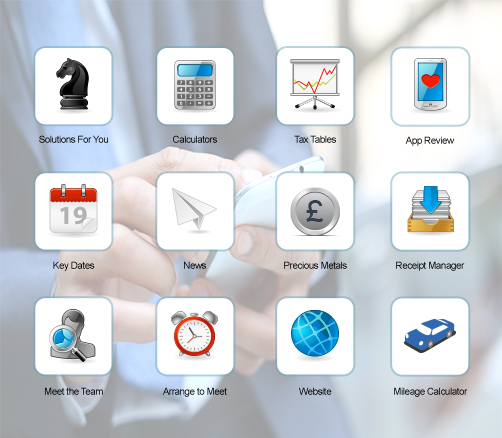 Amongst other things, the Murray Taylor App will enable you to check the amount of tax you might be paying, or see how you might increase your profits as a business. You can calculate the tax on certain company cars, or check Stamp Duty costs. You can also browse the library of tax tables, giving you the very latest tax rates 24/7 whenever you need them. From National Insurance and Inheritance tax to Income Tax and Tax Credits – it’s all there for you. Why did Murray Taylor develop its own App? We’re a proactive firm of accountants and love nothing more than helping companies and individuals to become more successful, more profitable and ultimately more enjoyable to run. The Murray Taylor App gives you great content and also makes it really easy to keep in touch – with a simple ‘arrange to meet’ page along with all our contact information and links to our social media pages. We hope you enjoy the Murray Taylor App! To quickly and easily download it, simply search for ‘MyAccountants‘ in your app store – the icon looks like the image below. Then enter the code MURRAY when prompted, and you’ll be able to access all of Murray Taylor’s new content and features! Please do let us know what you think by posting a review.